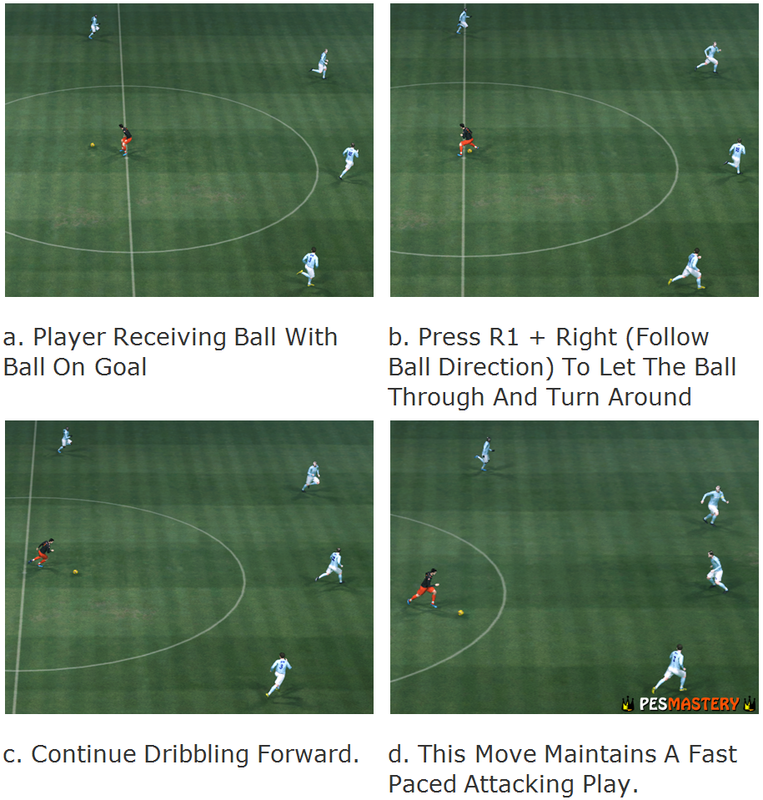 Controlling the ball well is crucial to keeping possession and determining our PES results. Besides allowing us to build up fluid attacking plays, good ball control helps us prevent our PES opponents from getting the ball when we are defending a slim lead. The best part is, ball control is easy to master! Here’s how. Just as you are about to receive the ball, hold ( L1 + direction ) to determine where the player would face after receiving. This allows you to shield the ball from defenders, keeping possession, or to face the direction you intend to pass or dribble, saving you precious seconds. To add fluidity to your PES attacking moves, use the turn and follow through move (R + direction the ball in travelling) when receiving a pass. This is a smooth move to continue moving in the direction of the ball. Not only it saves time, it also tricks the defender, making him stay rooted to the spot and you will be way ahead of him when he starts to chase back. This is a PES dummy play where your player pretends to receive a pass, but lets the ball run past him to another teammate. This move is useful when you find that your current player is being tightly marked, and you noticed a teammate running into space behind you. I will say there are not many chances in PES where you can actually use this, thus in the rare occasion when this is executed, savour the moment! To pull this off, simple press only (R1) as ball is approaching you. For total control of your player, with or without the ball, you should utilise the PES Super Cancel Control by pressing (R1 + R2). With the Super Cancel control, you would be able to control your player manually. You are now able to latch onto through passes by moving in front of defenders, and stop chasing a ball to let it go out of play. In addition, when you have a strong player, use Super Cancel to knock your opponents off the ball. When there is a situation where two players are running in the same direction towards a loose ball, you can use super cancel to block your opponent’s path, or to knock him off his path. More of this will be covered in the defending section. 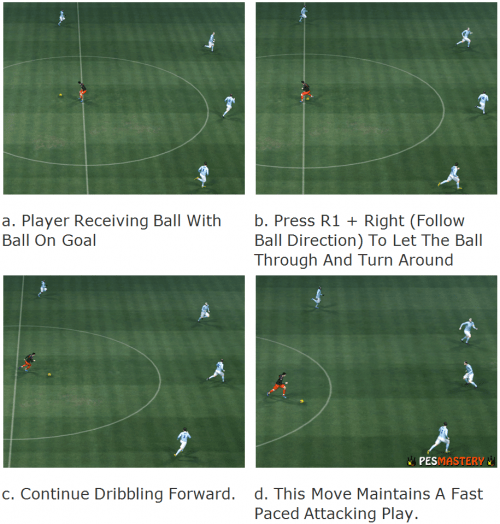 By apply these Ball Control strategies in your PES game, you will have ultimate control of the ball and the ability to dictate the flow of the game with ease. I want to know how to “cancel” or feint a pass? I think to do it with shoot, hold the Shoot button (Square for PS3), then before touching the ball, press the pass button(X) while holding square, then release, or am I wrong? now I just want to learn to fake a pass… and other tricks as well. Although PES is my favorite game ever, I have a problem with stopping the R2 shoot by the GK. It seems easier than it goes through. Could you help please. That step over is annoying. It seems to happen at the most critical moments causing great goal scoring chances to go begging. I hate it ! The ammount of chances that have cost me scoring because my player does a stupid step over from 6 yards out is ludicrous. The fact that it can be so easily and accidently executed is just stupid. I don’t flipping plan to step over when running onto a low cross into the six yard box I plan to hammer the ball into the net not step over the bloody thing ! I wish you could disable it. It is rubbish and ruins chances. How else am I to run onto a low cross without pressing r1 ? It is just a stupid move that ruins great moves and goal scoring opportunities. Nothing cool clever or good about it. It is rubbish ! The developers messed up in how they put it into the game. I hope they don’t make this hideous mistake again ! That’s interesting insight. May I suggest you turn off Auto Feint? Auto Feint might be triggering trick moves with a simple flick of your analog stick when you don’t intent to. Hope this solves the issue! Are you referring to the controlled shot? Yes it is a good way to score and is indeed hard to stop, especially from top players. The only way to effectively stop it, I must say, is to prevent your opponent from taking a controlled shot with his stronger foot. To execute standing tackle, press X (Playstation) / A (XBOX) twice. To make a successful tackle, you have to time it well, going in for the tackle only when your defender is near to the opponent. 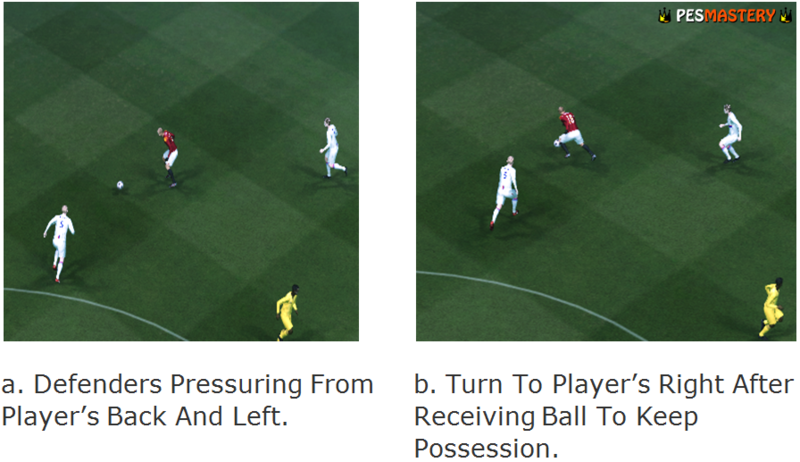 There are other aspects of tackling too, and I recommend you check out the PES Defending Tutorial.